Saturday night's Bellator 214 card was a tale of different outcomes for a athletes that could be labeled “prospects.” On one hand, Jake Hager earned a one-sided victory over J.W. Kiser, but on the other Aaron Pico was demolished by Henry Corrales. As Bellator MMA continues to build its coffers of “homegrown” talent, it's intriguing to watch the way the organization handles each fighter’s development. It’s never an exact science, but there is a formula to helping these men and women become the draws that Bellator hopes they become. So one wonders in the case of Pico why the formula is not being followed, and whether these hiccups that he is experiencing are the fault of his camp, or the decisionmakers in Bellator. 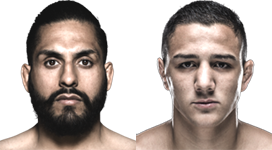 In the co-main event, Pico dropped an important bout in his young career to Corrales, losing via first-round finish. That defeat halted the momentum he built up while amassing a four-fight win streak, a streak that was started after Pico was put to sleep by Zach Freeman in his MMA debut at Bellator 180. Now questions are being raised as to whether Pico was rushed, and whether he should look to take on lesser-known talent while he gains in-cage experience. 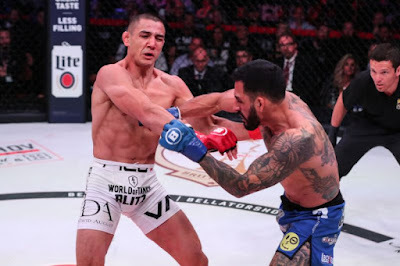 However, this is not a suggestion that Pico has taken too well, especially when he was being pegged as a potential title threat for Bellator's featherweight champion, Patricio Freire, going into the fight last weekend. Those last few words bring the conversation to a vital point about matchmaking for prospects who are making the leap to mixed martial arts under the Bellator banner. For some, the promotion has made it a point to book fights that are meant to be showcases for the new talent. (Think of the way Hager, Heather Hardy, and Bobby Lashley have been booked – they all faced talent much lower on the challenge meter.) But others have been given tough fights, and that hasn’t always worked out. If Bellator is looking to leverage individuals that come in with recognition from other sports and build them up into homegrown stars, perhaps it’s time for there to be some consistency in their matchmaking. On one extreme is the way the promotion has handled Valerie Loureda, an approach that has recently stirred up controversy. The Taekwondo Olympian was scheduled to debut at Bellator 215 against Anastasia Bruce. That was before the bout was nixed by the Association of Boxing Commissions, largely because it was a clear mismatch in skill. (Bruce is 0-12 as an amateur fighter and this would've been her pro MMA debut.) It’s clear that Bellator was attempting to stage the closest thing possible to an MMA version of the pro wrestling “squash match,” but the governing body had to wave off the manner in which the promotion was planning to welcome its debuting prospect to the cage. Now Loureda is booked to face 1-2 Colby Fletcher, a woman who has not fought in nearly three years. The level of talent that Pico has faced in his six-fight career, however, is far more like that of the current Bellator lightweight champion, Michael Chandler. Chandler was thrown directly into the deep end of the talent pool, facing the likes of Marcin Held, Lloyd Woodard, Patricky Freire and Eddie Alvarez in his sixth through ninth professional fights (although that was due to Bellator's tournament structure at the time). It worked out for all parties in the end though, as Chandler was victorious and emerged as a champion the company could build around. The question at hand is whether Pico can flourish in a similar way. He’s lost twice, but some may see value in taking losses early in one’s career to help lessen the pressure of losing. A lot will depend on his next step. He can take fights against less regarded opponents and hurt them badly, as he claims he will. Or he can continue to challenge himself against veteran fighters that are more prepared to deal with what he has to offer. The risk and reward are clear cut in this situation. Pico can either build up his experience slowly or keep swimming with sharks, hoping to quickly gain the knowledge needed to keep from getting mauled. At just 22 years of age, Aaron Pico is a special talent whose career is being watched by many. He’s taken two devastating losses early in his career, but the first time, he bounced back to win four in a row. But after this Bellator 214 loss, the story shifts to whether he’s willing to slowly rebuild his momentum against lesser fighters, or insistent upon taking on the stiffest tests available. The former seems to be the better plan, but the latter could be the course that Bellator and Pico take, much to his detriment.